What is a Verified Technology? A Verified Technology has been through a Verification Process. This means that a third-party has reviewed all the data that supports the technology's performance. This third-party, called a Verification Body, has checked that the data is consistent, of good quality and that it covers the important aspects of the technology's performance. After completing the Verification Process, a Statement of Verification is issued. This document can become part of the technical documentation of the technology and summarises the results of the verification process. The structure of the Statement is defined in the General Verification Protocol, as well as the rules and principles for using it. 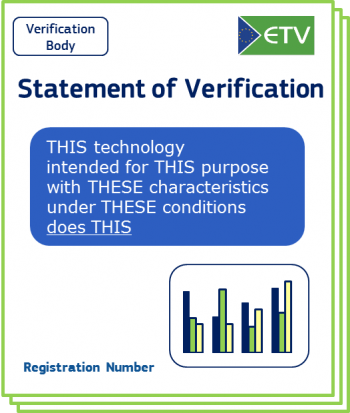 The document has a unique registration number, an ETV logo and a date of issuance. The official publication of the Statements is done by the European Commission services on this website. How many technologies are in the pipeline? The EU ETV pilot programme is a voluntary process. Technologies are submitted for verification to Accredited Verification Bodies by interested technology developers. Based on the results of the first steps, the process may go on with the drafting of a specific verification protocol and later on, after testing if required, by a verification report. The publication of the Statement of Verification on this website is the endpoint of the verification process – and hopefully the beginning of a success story.